REGINA - Kevin Glenn is coming home to finish his CFL career. 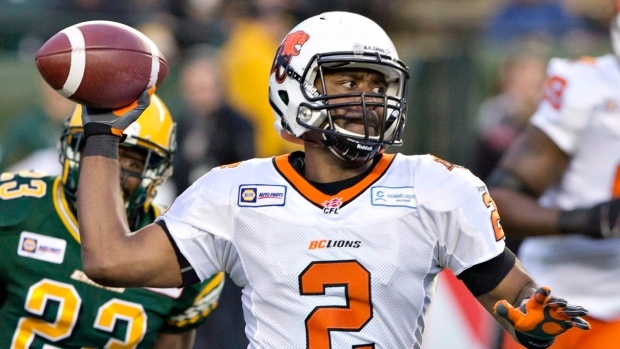 The veteran quarterback signed with the Saskatchewan Roughriders as a free agent Thursday. Glenn, 35, began his career with Saskatchewan in 2001 and spent three seasons with the club before being traded to the Winnipeg Blue Bombers. "I want to write a book when I'm finished and this would be a great story to tell, coming full circle like this," Glenn told reporters. "When I left Saskatchewan it wasn't on my terms, I got traded so I never had any ill will towards Saskatchewan. "I had a great time when I was here." Glenn started 17 regular-season games last season with the B.C. Lions. He completed 302-of-479 passes (63 per cent) and was the league's second-leading passer with 3,918 yards while adding 17 TD strikes. Glenn will battle for backup duties with Saskatchewan as incumbent Darian Durant — a friend of Glenn's — is firmly entrenched as the club's starter. The Riders were 8-2 with Durant under centre last season but lost six of their last eight regular-season games and the West Division semifinal after Durant suffered an elbow injury. "We all know Darian is the starter," Glenn said. "My job is to come in and compete . . . I'm not here to come in and cause any drama or anything. "I'm here to make the team better. I think that's one reason that Darian has already accepted the fact that I've signed here . . . he knows that's the type of person I am. I'm looking for something special this year, really really special." Riders GM Brendan Taman said Glenn has always been a team player. "He has shown throughout his career he does what's best for the team," Taman said. "He knows what he's coming into and there's no hidden agendas. "He loved his time here the three years he was here and that's a big part why he's back." Glenn has played in 222 career CFL games with Saskatchewan, Winnipeg (2004-08), Hamilton (2009-11), Calgary (2012-13) and B.C. (2014). He's eighth all-time in passing yards (43,336) and 10th in TDs (238). Glenn weighed offers from both the Riders and Montreal Alouettes but said his familiarity with Saskatchewan, and prodding from his five-year-old son, convinced him to return to Regina. "I did ask my son, he'll be six in March," Glenn said. "I asked him, 'Montreal or Saskatchewan,' and he said Saskatchewan so I have to go where my son tells me to go. "It did come down to where I felt comfortable and it felt good to come back home. This is where I started, it felt like a good situation to come back home." The Riders also signed American defensive lineman John Chick to a contract extension and free-agent national offensive lineman Gord Hinse. The six-foot-four, 250-pound Chick is entering his sixth season with Saskatchewan and is now under contract to the CFL club through the 2016 season. Chick had a CFL-high 15 sacks last year while adding a career-best 45 tackles to capture league all-star honours. Chick, 32, has registered 42 sacks in 73 career regular-season games with Saskatchewan. He has helped the Riders win two Grey Cup titles (2007, '13) and was the CFL's top defensive player in '09. The six-foot-four, 307-pound Hinse spent last season with the Winnipeg Blue Bombers after playing his first five seasons with the Edmonton Eskimos. Hinse, 27, has played 52 career regular seasons games at both centre and guard. Note to readers: ADDS quotes, details.